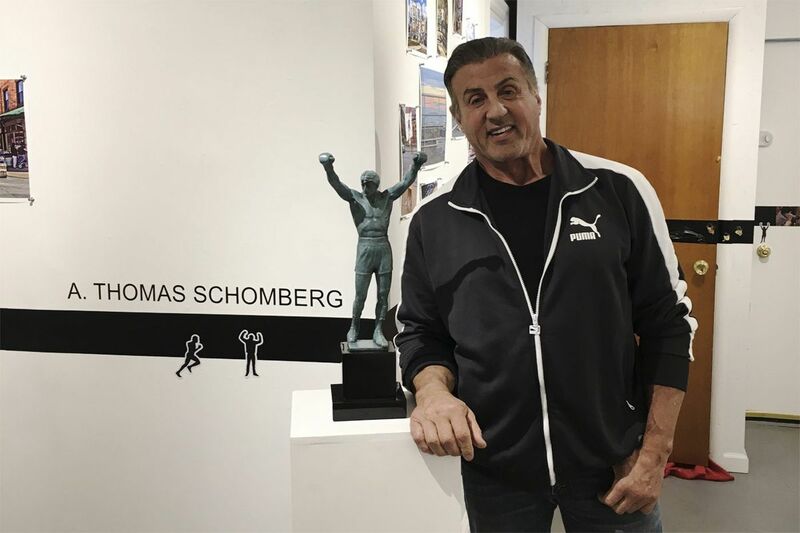 Sylvester Stallone poses with a statuette of Rocky Balboa by sculptor A. Thomas Schomberg at the Da Vinci Art Alliance in South Philadelphia in Friday, April 20, 2018. Sylvester Stallone paid a very public visit to the Philadelphia Museum of Art earlier this month to celebrate Rocky while he's in town working on Creed II. But his trip last week to one small South Philly art gallery was a little more private. On Friday, Stallone stopped into the Da Vinci Art Alliance's (704 Catharine St.) Rocky (re)Runs art exhibit, which debuted in early April. The actor arrived at the gallery with a small group after an assistant set the visit up, DVAA executive director Jarrod Markman tells the Inquirer. Several of the show's artists also tagged along. "The impression that I got was that [Stallone] wasn't super into memorabilia-type things, or things with his face on them," Markman says. "I was excited for him to come because the exhibit takes an artful look at the Rocky movies." Organized by architecture professors John J. Pron and Andrew Hart, Rocky (re)Runs looks at the Italian Stallion from artistic, academic, and architectural perspectives in a departure from the franchise's blue-collar, low-budget roots. The focus, Pron said earlier this month, is Philly's "hidden neighborhoods" — areas Rocky Balboa passed through on his famed 30.61-mile run in Rocky II. Stallone, second from right, with DVAA executive director Jarrod Markman, left, DVAA marketing coordinator Dawn Kramlich, second from left, and DVAAboard president Linda Dubin Garfield, right. Stallone, who Markman describes as "kind and generous," walked through the exhibit quietly and stopped to take pictures with many of the pieces on display. One of his favorites, Markman says, seemed to be a stained glass depiction of the boxer titled "Rocky Stained" by designer Gabriella D'Angelo. While Stallone didn't buy anything, Markman jokes that the gallery is "still holding out." Stallone could not be immediately reached for comment. "He seemed impressed with the details of the exhibit," Markman says. "He was so warm, and he walked in like, 'Here I am, I'm excited to see this.'" The visit, Markman says, was a total coincidence. Work began on Rocky (re)Runs more than year ago, so there's little chance Hart and Pron could have predicted Stallone being in town during the exhibit's run. When the group found out Creed II would be filming this year, they still didn't really believe a visit from Stallone was a possibility. "It was an ongoing joke for the group," Markman says. "When [Stallone's people] called, the artists didn't believe me." Sylvester Stallone poses with Rocky (re)Runs exhibit co-organizers Andrew Hart, left, and John J. Pron, right, as well as WHYY producer Steve Kwasnik, second from right. Stallone's visit, however, should perhaps not be such a big surprise. The actor is, after all, a noted visual artist, having last mounted an exhibit of his own paintings in France in 2015. Titled Real Love, the exhibit showcased paintings made by Stallone from 1975 to 2015. "There is a public face and a private face," Stallone told Forbes of his painting career that year. "I feel the same way about art. It's a collage of emotions. And when you can transfer that onto the canvas, it's an amazing feeling." Rocky (re)Runs wraps its run at the DVAA on April 29. This Thursday, the gallery will hold a Skype Q&A with sculptor A. Thomas Schomberg, the Colorado-based artist who created the original Rocky statue now displayed outside the Philadelphia Museum of Art in 1980. Currently, Stallone is at work on Creed II, which started filming in Philly earlier this month. The film, the Rocky franchise's eighth installment, pits Adonis Creed, son of Apollo Creed, against the son of Ivan Drago, who killed his father in a boxing match in Rocky IV. Creed II is scheduled for a Nov. 21 release.